If you live in the Deep South, Florida or southern California and miss fiery red tree foliage of northern autumns, acquaint yourself with the Chinese pistachio tree. Not only does this tree form a lovely rounded crown to provide summertime shade, it also is not affected by drought or insect pests. Grow a Chinese pistachio as a lawn, street or park tree. The Chinese pistachio (Pistacia chinensis), sometimes called the Chinese pistache or Chinese mastic, is a flowering plant in the cashew family, Anacardiaceae. Although it produces small fruits, this species is not the source for the edible pistachio nuts, which comes from species Pistacia vera. This deciduous tree is native to hills and mountain forests on rocky soils, from elevations of 300 to 10,000 feet. It grows naturally in the southeastern half of China, including the island of Taiwan. Growing to a mature height of 50 to 80 feet and canopy spread of 22 to 30 feet, the Chinese pistachio is a more slender, upright tree in its youth. It has pinnate, or feather-like, leaves comprising 10 to 12 pointed leaflets of leathery dark green. In mid- to late spring, both male and female trees bear aromatic flowers that are tiny clusters of reddish green on branch tips. By mid-autumn, the pollinated female flowers develop into tiny, rounded, red fruits that mature to blue. 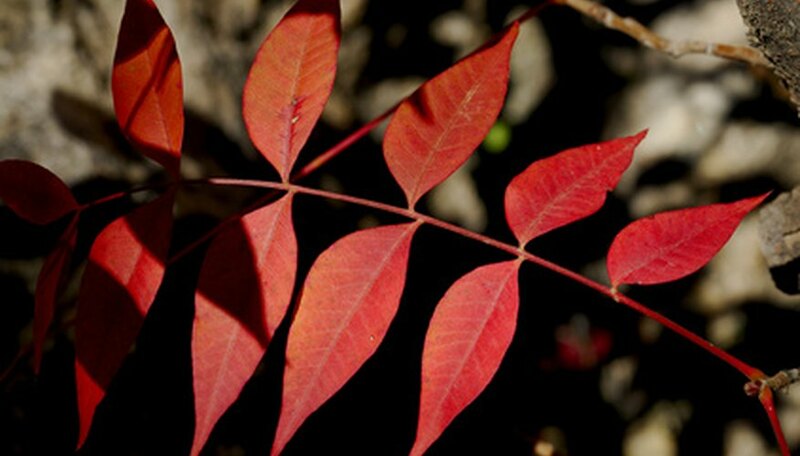 The glossy foliage blushes intensely yellow, orange and scarlet red before dropping off to better reveal the grayish-brown bark. Plant Chinese pistachio trees in fast-draining soil that has some fertility, one that already supports any type of plant growth, including weeds or grass. For best growth and shape of your developing tree, full sun is best--a location with at least eight hours of direct sunlight daily. This tree is widely adaptable and tolerant to acidic, neutral and alkaline soils as well as to landscapes often plagued by heat and drought. It is appropriate for use in USDA hardiness zones 6 through 9, or zone 10 in the more arid summer regions of Mediterranean climates. Because this tree species is dioecious--having different gendered flowers on separate trees--the fruits form only on female plants. The dropping fruits in late autumn pose a potential hazard if piled on sidewalks, and a messy nuisance in formal public landscapes or boulevards. Male-gendered trees are preferred, but are not sexed until a large sapling, when the flowers first appear. Also, if the soil in which your Chinese pistachio grows is too moist or prolonged wet, chances for root rot and verticillium wilt increases. Too much shade on the foliage may lead to scale infestations.